Free shipping. Buy direct from HP. 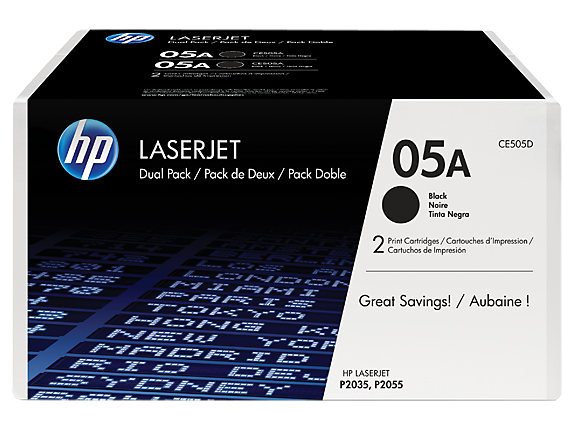 See customer reviews and comparisons for the HP 05A 2-pack Black Original LaserJet Toner Cartridges, CE505D. Upgrades and savings on select products. HP helps lower the cost of Original HP cartridges with a high-value option for high-volume printing.Save money—double the print volume at a lower price with two Original HP cartridges in one packageReduce your company’s printing costs without sacrificing reliable, professional results.Gain peace of mind with HP’s Premium Protection Print Cartridge Warranty. Minimize interruptions with the added convenience of Original HP LaserJet Toner Cartridge Dual Packs.Shopping for and reordering Original HP printing supplies is easy with HP SureSupply .Free, convenient return and recycling in over 49 countries HP can be a trusted partner in helping meet your company's environmental program objectives. Minimize interruptions with the added convenience of Original HP LaserJet Toner Cartridge Dual Packs.Shopping for and reordering Original HP printing supplies is easy with HP SureSupply.Free, convenient return and recycling in over 49 countriesHP can be a trusted partner in helping meet your company's environmental program objectives. 1 Program features and availability vary by country. For more information, visit http://www.hp.com/learn/suresupply. 2 Available in select countries. For more information visit: http://www.hp.com/recycle. 3 Declared yield value in accordance with ISO/IEC 19752. Actual yields vary considerably based on images printed and other factors.